This is the gold standard of pizza flours by which most others are judged. 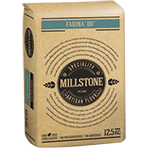 In Italy, flour is categorised according to how finely it is milled. The higher the number on the label, the coarser it is. ’00’ flour is the finest you can get – almost the texture of corn flour. This fine texture is perfect for making fresh pizza bases, in the true Italian tradition – a must for food lovers who prefer to make their own pizzas from scratch, to be savoured and enjoyed with family and friends. Product of South Africa.